The Contract Signature Change Authorization is used when you need to change the signature of the person who signed an agreement. The other option would be to have all parties resign a new agreement. contracts which has helped my business 100% because it covers every detail from start to finish and it is easy for the clients to understand ... EXCELLENT product." This Contract Signature Change Authorization is included in editable Word format that can be customized in Word or by using the included Wizard software. Description The following is an amendment to the previous established and contracted relationship between Company Name and Company Name and is to act as an addendum to any existing contract or relationship established between the two parties. The undersigned party desires to change the signature on the agreement for the responsible party. Signature change acceptance can only be authorized by the CEO, CFO, COO, etc. 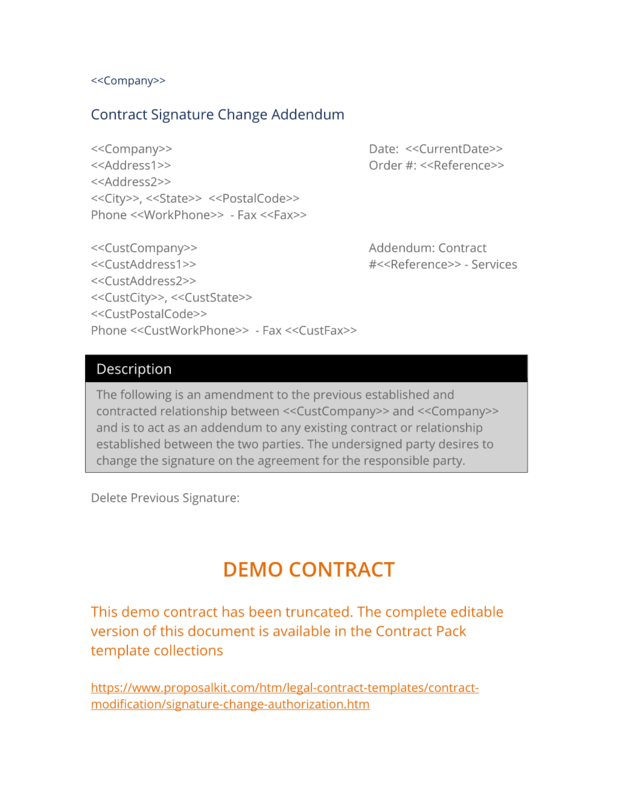 The complete Contract Signature Change Authorization - with the actual formatting and layout - is available in this Contract Pack.